Our Plants that Work® program offers premium plant material for creating incredible container gardens. With more than 125 varieties available in a multitude of genera, Sunbelt is an excellent source for that "just right" filler, spiller and thriller. Each 4.3" pot contains an oversized tag with details concerning growth habit, sun tolerance and water needs. Set your garden center apart by offering some of the more unusual varieties, like Brachyscome 'Radiant Magenta', Cuphea 'Cuphoric Pink', Mercardonia Bright Yellow, Nierembergia 'Lara White', Ruellia 'Ragin' Cajun™' and Sanvitalia 'Tsavo™ Golden Yellow', each of which adds a unique touch to mixed containers. They can also be planted in single-variety clusters for a specimen display. Encourage customers to include interesting color and texture and in their mixed containers by displaying our 3.5" Accents. 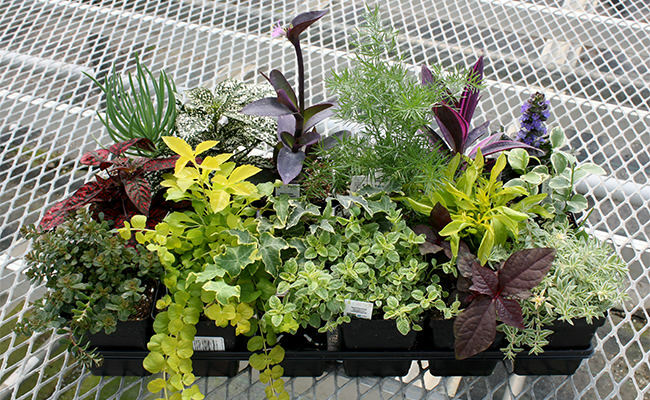 Shown above are just a few terrific examples: Ajuga, Asparagus Plumosa, Duranta, Hedera Helix, Hypoestes, Lysimachia, Sedum, Setcresea, Variegated Oregano and Vinca Vine variegata. Sunbelt also grows Alternanthera, Dichondra, Dracaena, Helichrysum, Ipomoea, Iresine, Lamium and Sprengerii Fern in the Accent program. Cross-merchandise these attractive plants with flowering annuals, placing them near your container potting area for add-on sales. Use signage that designates their purpose, and be sure to include accents in your mixed container recipes. Alternatively, create a few mixed accent containers to show off their range of colors, textures and growth habits. For easy-care color, look no further than Calibrachoa. Most varieties work well planted alone or as part of a combo in baskets, patio pots and window boxes - virtually anywhere it can tumble. Calibrachoa also performs well in landscape beds; sunny and cool locations are better than sunny and hot. Although less fussy than its petunia cousin, calibrachoa likes to be watered and fed. Deadheading will encourage plants to re-bloom. Sunbelt produces calibrachoa in 4.3" 10-ct Plants that Work® and 11" hanging baskets.